"Evaluation Of Diesel Engined Jeep (Japan)"
The U.S. Army decided in 1966 to evaluate the performance of Mitsubishi's CJ3B-JC3, a diesel version of their CJ3B-J3 civilian Jeep. The Army had already been using a limited number of Mitsubishi's gasoline-powered military CJ3B-J4 version. The 134 cubic inch KE31 diesel was rated at 61 horsepower @ 3600 RPM, with 97 lb/ft of torque. 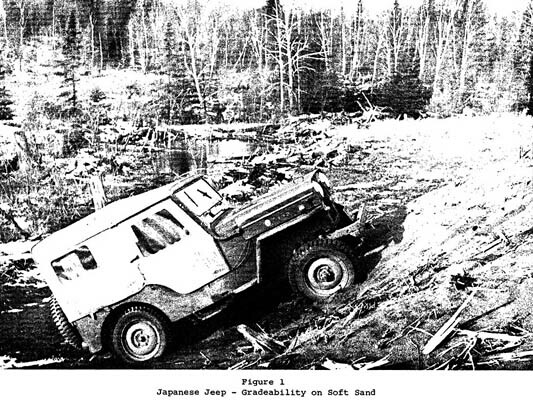 "The JC3, 1/4 ton, Diesel-engined Jeep, manufactured in Japan by Mitsubishi Heavy-Industries, Limited under license from Kaiser Jeep Corporation, was evaluated for its general performance, handling, and endurance over varied terrain; including pavement, secondary roads, cross country, and snow. "The overall performance of the vehicle compared favorably with the American version of the Jeep. The Diesel engine gave it better economy, although it was more sluggish, and the engine noise was somewhat objectionable on longer duration runs. No significant maintenance problems were encountered." So, apparently no surprises. But it's still an interesting read, and there is one little surprise at the end. The 34-page report was prepared for the U. S. Army Tank-Automotive Center in Warren MI, which had been created after WWII as a research lab for the Detroit Arsenal. 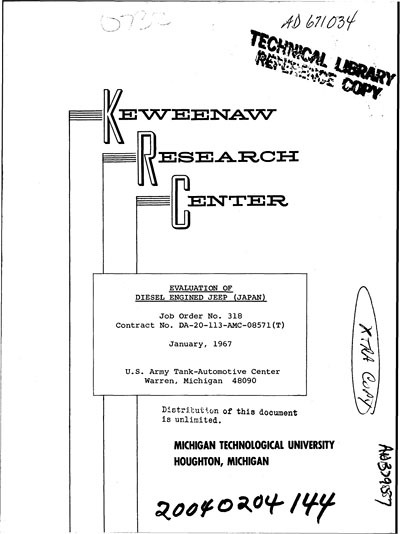 The cover is labelled "Distribution of this document is unlimited." The complete report is available as a PDF file from the Defense Technical Information Center. 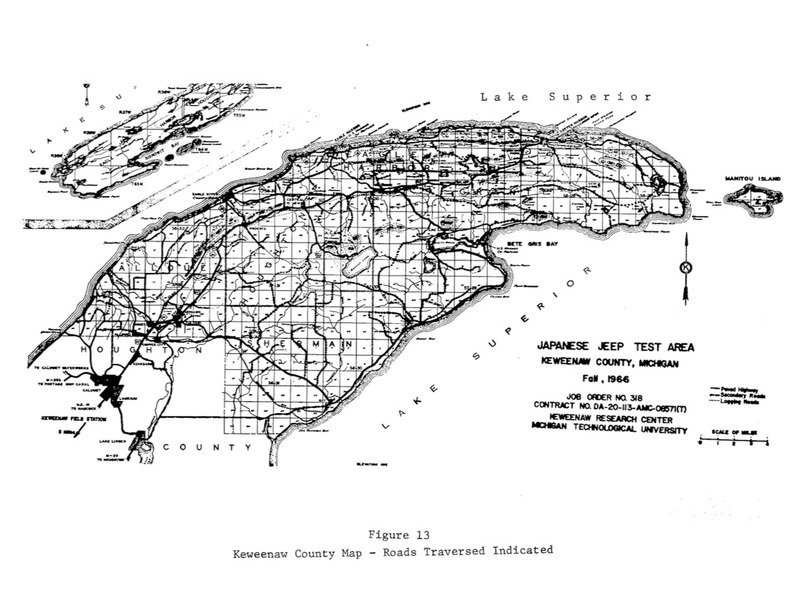 The Introduction states: "The major portion of the vehicle operation was over test routes selected in the Keweenaw County area, which is northerly from the Station. Access to the test areas was over paved roads, but within the test areas themselves the roads were either secondary or rough logging roads, and cross-country through wooded and rugged terrain." See a Keweenaw County map (230K JPEG). A. Observation and measurement of the physical characteristics of the vehicle. B. Performance including gradeability on various soils; slope stability on sand, loose soil, and packed dirt; braking ability on wet and dry pavement and secondary roads; fuel economy and acceleration. C. Mobility in terms of drawbar pull on varied terrain, including shallow mud, dry sand, packed clay, and paved surface. D. Durability and reliability over 1,000 miles of operation. E. Operation, maintenance and deficiency records. 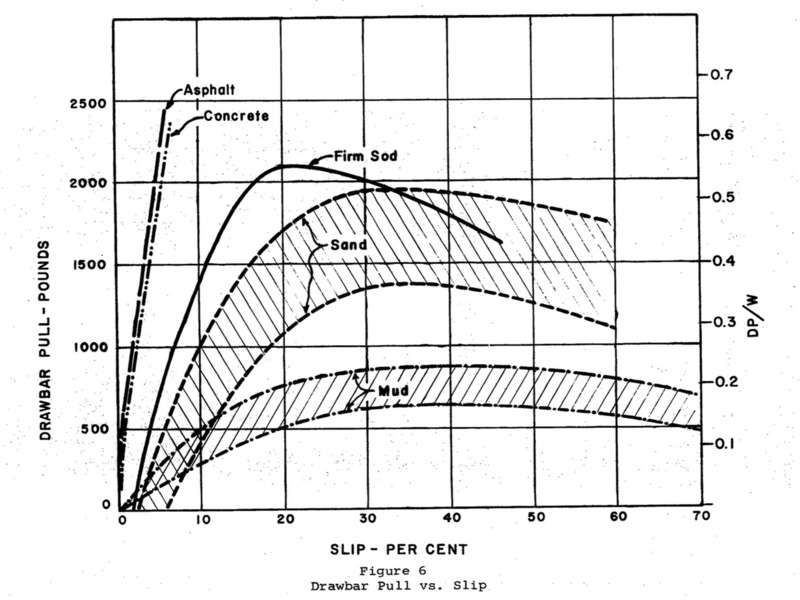 "Gradeability ranged from 35% on soft sand up to 60% on hard sand, 55% on loose soil, and 65-70% on packed dirt." 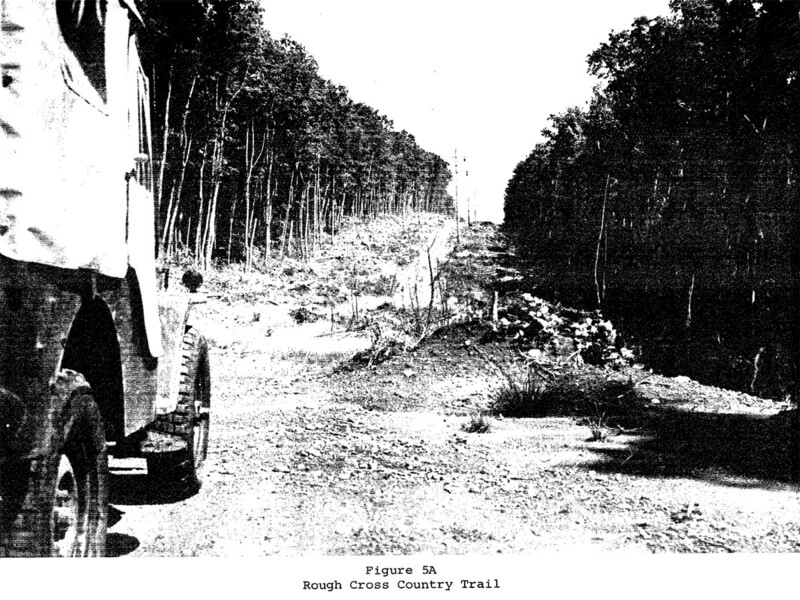 "On packed dirt the maximum side slope negotiated approached 35°, and even in this success was marginal. 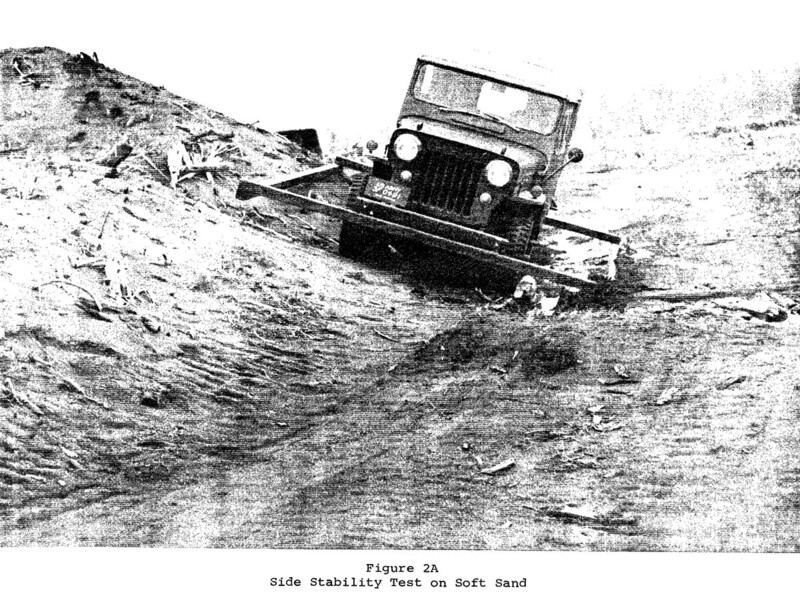 On sand the maximum slope was limited to less than 25° (see Figure 2A, 400K JPEG). Both of these figures are considerably less than the maximum safe tilting angle of 44° specified by the manufacturer." 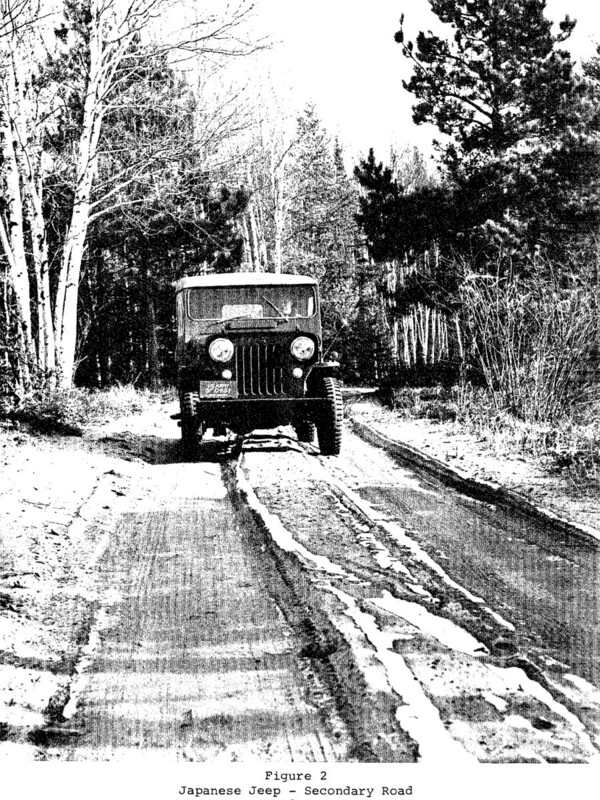 "On dry surface the average stopping distance from an initial speed of 80% of maximum, which for this vehicle was 44 mph, was 79 feet on concrete, and 101 feet on secondary gravel roads. 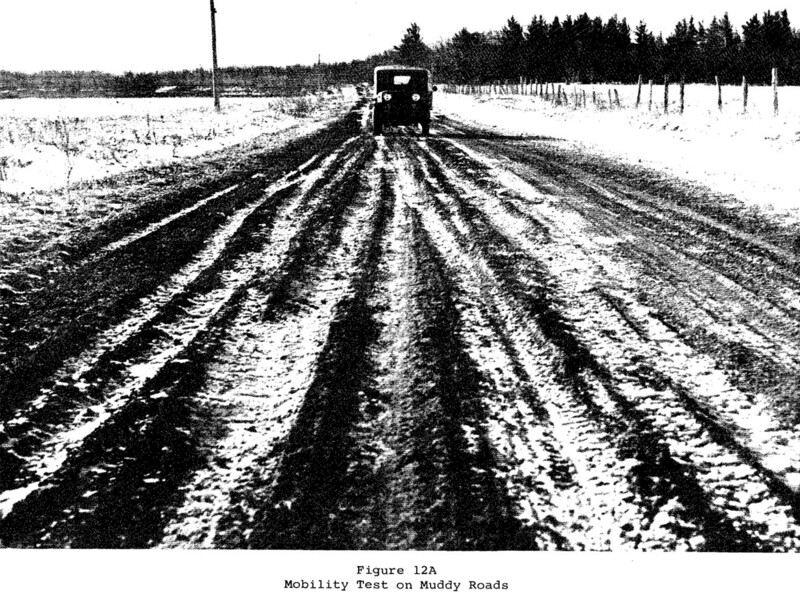 On the same surfaces, when wet, the distances were 121 feet and 124 feet, respectively. 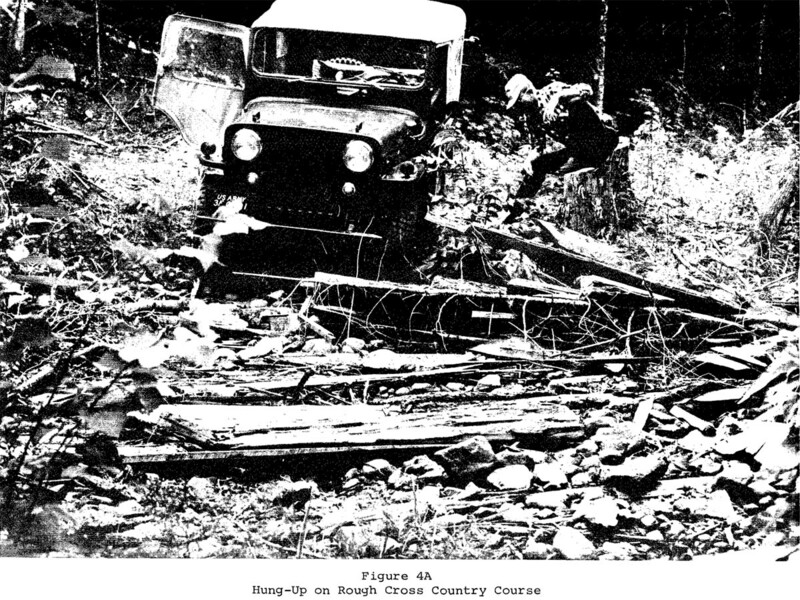 "From initial speed of 40% of maximum, which was 22 mph, the stopping distance on dry concrete was 20 feet, and on dry gravel road 27 feet. Under wet conditions the distances were 24 feet and 28 feet, respectively." 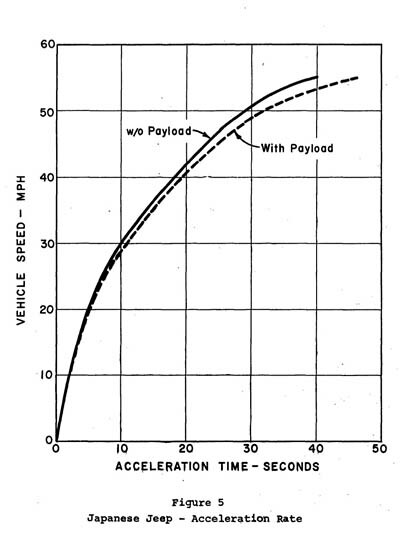 "Acceleration tests conducted on smooth, level concrete pavement, showed that 40 seconds were required to reach maximum speed of 55 mph, without payload, and 45 seconds for this same speed with payload. In that the engine was equipped with a speed governor the time for the last portion of the acceleration period varied considerably during the test. 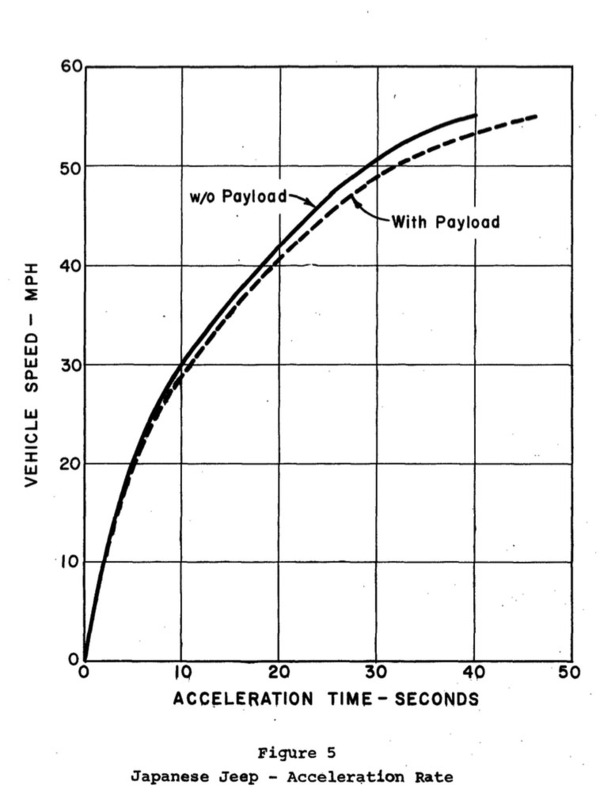 Possibly reliable comparison would be the 29 seconds to reach 50 mph, unloaded, and 32 seconds when loaded." 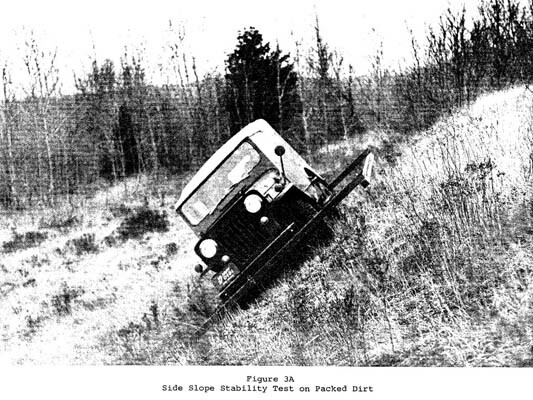 "The first portion of the mobility test involved a drawbar pull measurement on various soils." "The maximum drawbar pull attained was 2,450 pounds on dry pavement with approximately six percent slip, the maximum attainable. This corresponds to a drawbar pull/weight ratio of 0.65. 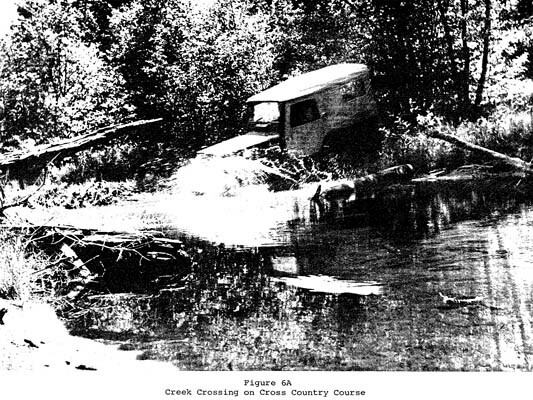 The limiting factor on the maximum slip in this case was engine power." "On firm sod the maximum drawbar pull was 2,100 pounds, at a slip of 23 percent, with a maximum attainable slip of 46 percent. 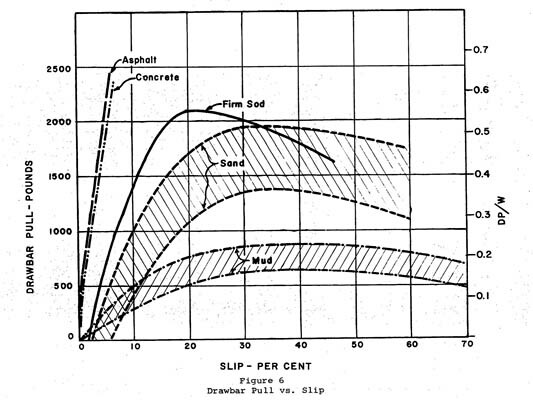 Sand conditions (see Figure 1A, 450K JPEG) limited drawbar pull to a maximum of 1,950 pounds at 35 percent slip, and mud further reduced the drawbar pull to 775 pounds with 40 percent slip." "In addition to the drawbar pull test, further mobility measurements involved qualitative observations on various cross-country courses. 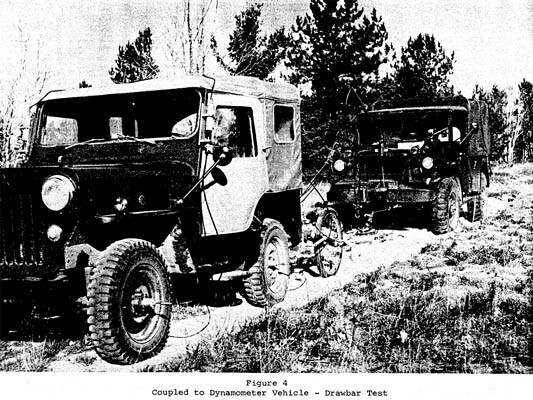 "The vehicle mobility was judged by an experienced test driver to have performance comparable to the military M38 Jeep. On no occasion was power limitation a cause of immobilization." "Vehicle mobility limits usually involved getting 'hung-up' on the under carriage. 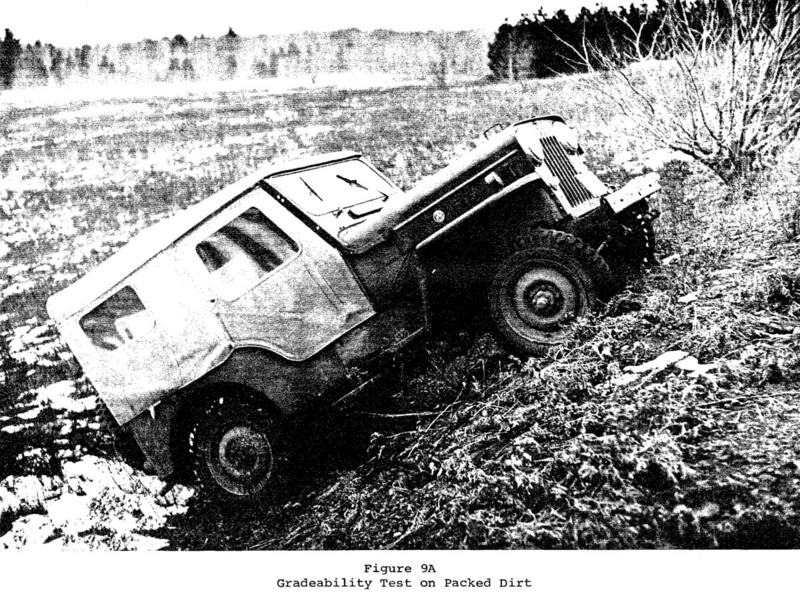 This occured in soft soil and also in snow which was encountered at the end of the vehicle test. 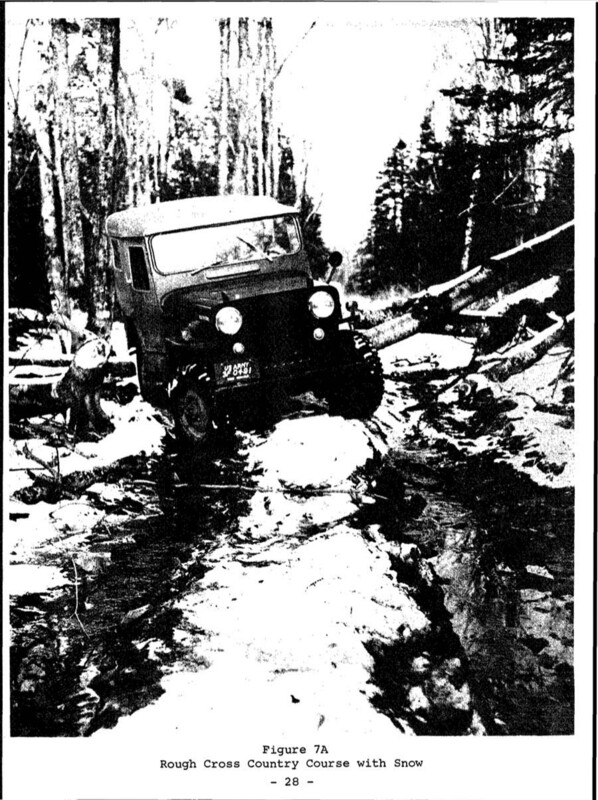 In several instances the vehicle became hung-up on protruding obstacles; and in other cases, on ordinary soft soil surfaces, after the wheels dug themselves into soft ruts." "A similar problem was encountered when snow accumulation caused decreased traction and high resistance to motion, and finally hanging-up on the underbelly. 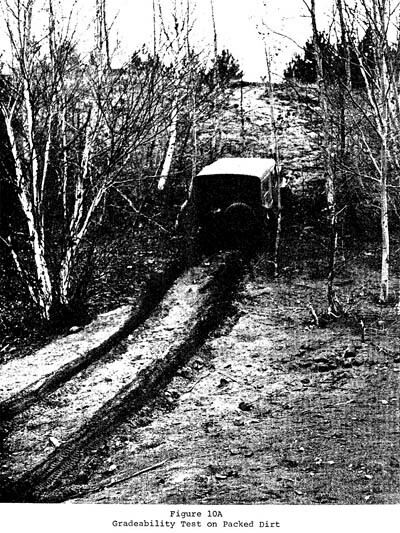 Mobility limiting snow conditions finally required sending in a track-laying tractor into the test area to retrieve the vehicle when it became immobilized in snow." 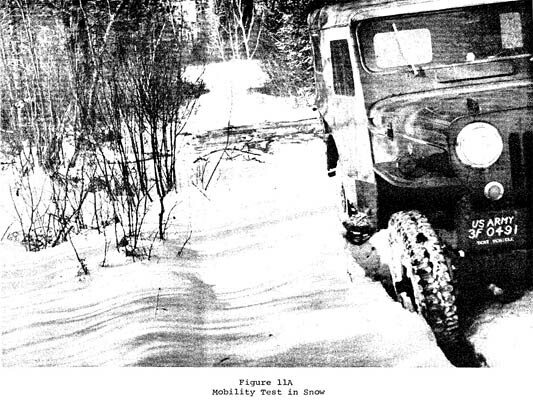 A note on cold starting, which was not part of the specified test procedure, revealed that after the SAE 20 oil was replaced by SAE 10 winter oil, the Jeep, which was equipped with glow plugs, started on cold mornings at -7°F (-21°C) but would not start at -16°F (-27°C). A note on reliability is the only real eyebrow-raiser in the report. It states that two identical sample vehicles suffered similar major engine failures prior to the start of the test. The cap screw holding the drive gear on the camshaft worked loose, allowing the camshaft to shift rearward in its bearings and causing the valve lifters to break. The engine of the primary test vehicle had to be replaced before testing could begin. A longer cap screw solved the problem, and there were no other major problems with either the engine or the running gear. 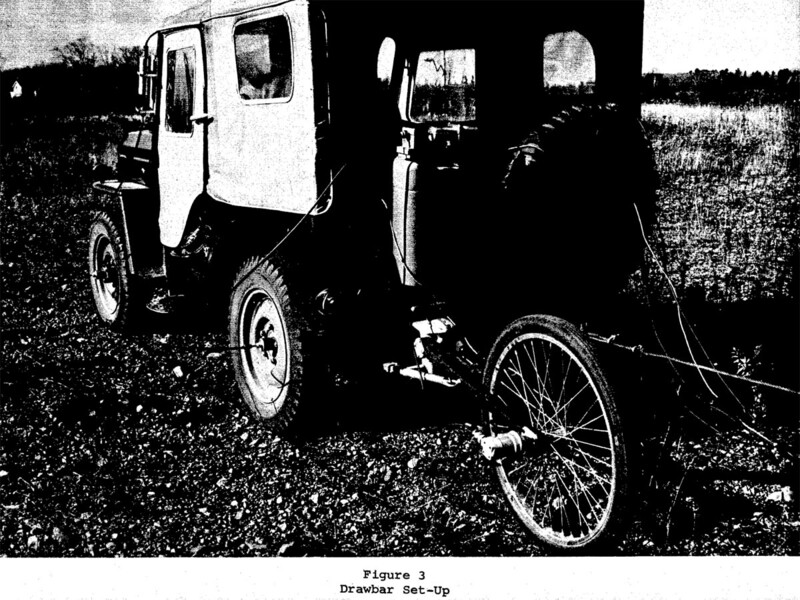 I have not seen any evidence of reaction to the report, but as far as I know the U.S. Army never purchased any of the JC3 diesel Jeeps. 1) Historic Properties Report: Detroit Arsenal and Subinstallations at DTIC. 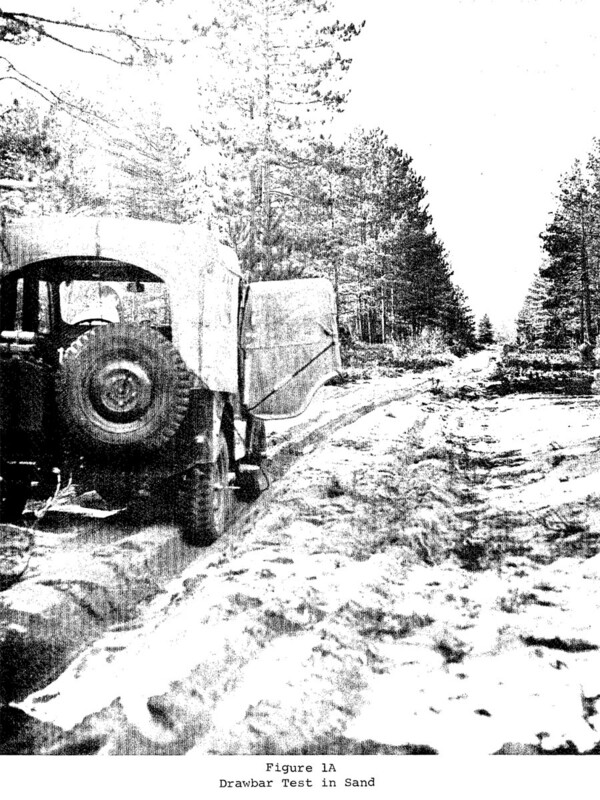 Return to M606 Military Jeeps. See also more Mitsubishi Jeeps on CJ3B.info.